The Fourth of July is a day for celebrating freedom in the United States - the day marking the country’s birth and the founding of a government by the people, for the people. For those living in cannabis-friendly states, the celebration of freedom takes on a new meaning whether they partake or not; the people have spoken and pro-marijuana laws are on the books. Mixing with the marijuana smoke this Independence Day will invariably be two other fire-born fumes: the smell of grilled food and the sulfurous discharge of bottle rockets and other fireworks. It’s the latter which serves as a central subject of this article, particularly for those with cats and dogs. As many pet owners know, the explosive pops, sudden screeches, and scattered bursts of firewnorks noises can cause considerable stress to our furry friends, particularly dogs suffering from noise phobia and any animal suffering from existing anxiety. While shielding your anxious pet from the sounds of fireworks this Fourth of July with the help of closed windows, television volume on high, barn fans and other tricks ought to be considered, they might not work for everyone. In these circumstances, the cannabinoid known as cannabidiol (CBD) is increasingly becoming the go-to for owners of noise-sensitive dogs and cats. The options of Canna-Pet products reveal that CBD for animals comes in many forms, including capsules, liquid, as well as turkey and maple bacon flavored treats. 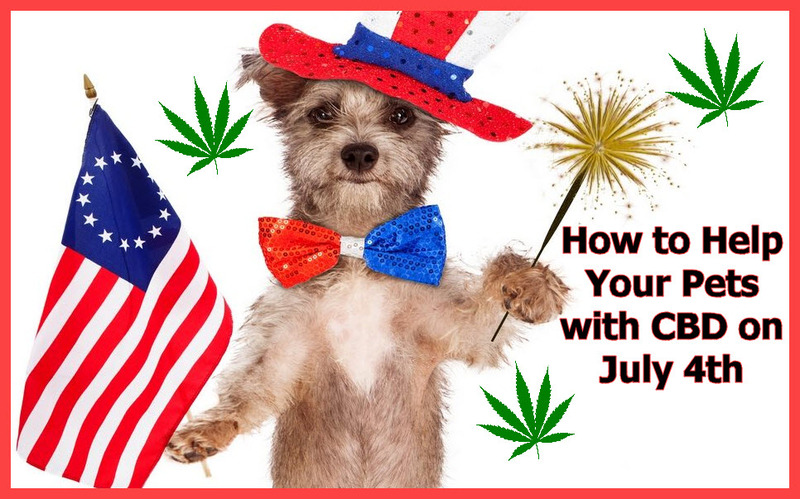 How can CBD help your pets during the 4th of July? Red, White and Blue Essential Oil Blend for July 4th! 4TH OF JULY Super WAKE and BAKE - BAKEDinVEGAS!! !